The Defence Committee of the Canadian Parliament has adopted a resolution in response to Russian aggression against Ukraine, Moldova and Georgia in the Black Sea region. The resolution says that over the last 30 years, Russia has instigated a series of wars and conflicts in the Black Sea region in attempts to maintain regional spheres of influence and to destabilize and deter countries like Georgia, Moldova and Ukraine from forging closer ties and integrating with the EU and NATO. To increase sanctions under the Justice for Victims of Corrupt Foreign Officials Act (Sergei Magnitsky Law) against those connected to the ongoing aggression against Ukraine, Moldova, and Georgia. To support the aspirations of Ukraine, Moldova and Georgia to join the NATO alliance in due course. To negotiate defence cooperation agreements with Moldova and Georgia. To support Ukraine, Moldova, and Georgia in their resistance to hybrid warfare attacks, specifically with regard to cyber-attacks on government systems and critical infrastructure, and in their resistance to the dissemination of foreign propaganda and disinformation through the media. To demand the release of all Ukrainian, Moldovan and Georgian political prisoners being held by Russia. To facilitate and strengthen parliamentary dialogue between Canada and Georgia, Moldova and Ukraine. 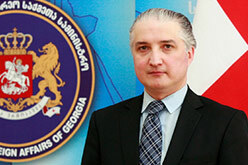 The Georgian Foreign Ministry representative Vladimer Konstantinidi called the resolution “ very important” and placed special emphasis on the recommendation which calls upon the Canadian government to enact sanctions against the individuals who have violated human rights in the occupied regions of Georgia.